Our Jadeite, Nephrite and Botyroidal (bubbly) Jade is gently sourced, harvested annually from riverbeds and outcroppings in Northern California, and worked locally by artisans in our Mendocino County workshop on the Pacific coast. 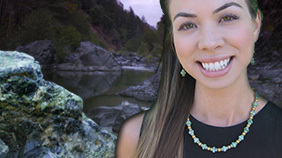 Available in raw and worked forms, as elegant jewelery, in strands, as nuggets, masterpiece carvings, and as boulders, California Jade is a rare and unique gemstone. Endowed with wondrous luster, color and opacity, California Jade is heirloom quality as both jewelry and viewing stone, or Suiseki. Beautiful, durable, tactile, Jade's unique and exceptional qualities make it one of nature's most precious offerings. 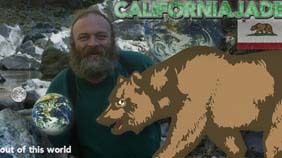 Specializing in rare California Nephrite and Botyroidal Jade for collectors, raw strands for jewelry making, carvings, boulders, unique masterpieces. The Largest Selection of California Jade Jewelry in the World: fantastic color, luster, texture,look, in a wide selection of elegant settings. California Jade: The Geologic Story of Nature's Masterpiece. 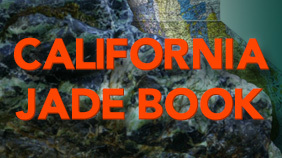 A fascinating and highly informative study of Jade in California by geologist Don Dupras. 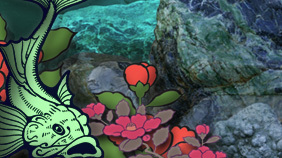 Jade info, insight, news and artistry from Sam and the Cal Jade staff. The visual beauty of River Blossom Jades is evident to all, it has tactile pleasure that is undeniable, it’s rarity is much sought after, but do we know the entire story? From the Trinity Alps to you, our number one priority is to be in harmony with Mother Nature and our fellow humans. © Copyright 2018 CaliforniaJade.com All Rights Reserved.